Capt. Ryan Gilbert, combat rescue officer with the 943rd Rescue Group, briefs members of the Tucson Military Affairs Committee March 14, 2019 on the Tucson based Air Force Reserve’s premiere rescue capabilities at Davis-Monthan AFB, Ariz. providing combat-ready Citizen-Airmen and resources, anytime, anywhere in the world. Col. John D. Beatty, commander, 943rd Rescue Group, hosted 50 civilian and military guests for the event, during which he presented an impressive Air Force Reserve capability to organize, train, and equip mission-ready, citizen-airmen to perform personnel recovery operations worldwide. As a premier combat rescue organization, the 943rd RQG provides combat-ready Citizen-Airmen and resources, anytime, anywhere in the world. The group is deployed globally supporting joint operations in every theater imaginable with a 70% Reserve force. The men and women of the 943rd, have part-time military jobs that require full-time readiness. 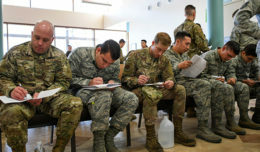 While holding down civilian jobs, going to school, and raising their families, they must also maintain the exact same military qualifications as their Active Duty counterparts. Many do extra time in uniform to ensure they meet and exceed the training needed to ensure they are expert life-savers who can serve in dynamic and dangerous situations. The nearly 600 Airmen assigned, keep a daunting operations tempo, not only deploying globally to every theater of war, but operating in support of both local and international rescue needs. At its home stations, the group’s five squadrons and two flights, can often be partnered with local, state, and federal agencies to assist with civilian rescues both here in Southern Arizona, and at its geographically separated unit the 304th Rescue Squadron in Portland, Oregon. Responding to lost hikers, and injured skiers in America’s deserts and mountains is just as common as airlifting American and allied warriors from harm’s way off of battlefields in foreign lands. The group has conducted famous rescues like saving Corpsman First Class Marcus Lutrell, a U.S. Navy SEAL, from a Taliban stronghold in Afghanistan, in 2005. Jimenez, representing the business communities of Southern Arizona, knows that the quiet professionals at the 943rd have conducted thousands more rescues than the one told in the Hollywood movie Lone Survivor, but she wanted to make sure the other business leaders knew the group’s impact to national security as well as their economic impact to local communities. 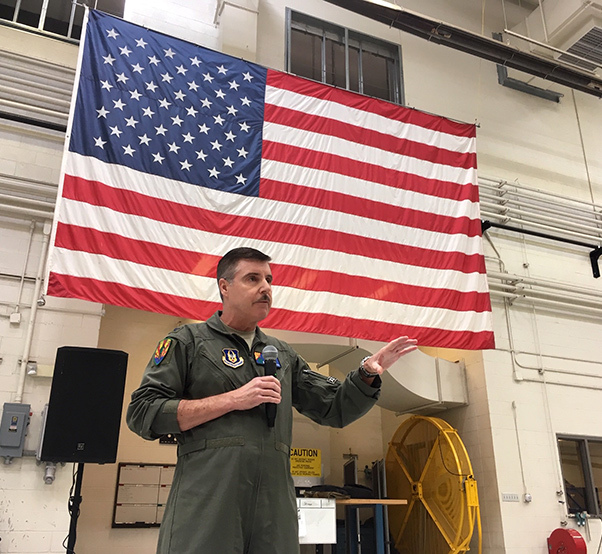 Col. John D. Beatty, commander, 943rd Rescue Group, speaks to the Tucson Military Affairs Committee March 14, 2019 at the 943rd Maintenance Squadron Hanger. The 943rd’s last economic impact analysis was completed in 2017, at which time it was found the unit provided $48,937,980 million to the local Arizona economy, and $12,332,863 million in Oregon. 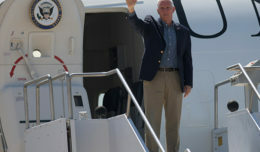 Jimenez applauded local support for the Reserve reiterating the importance of Reserve forces in an area mean members serving there are local citizens, who buy homes, pay taxes, attend local schools, and vote in the same cities and states in which they serve. Hosting an elite force of Reservists is a source of pride for Jimenez and her colleagues, who know Tucson and Portland will retain and benefit from these talented heroes and their families. Col. Beatty emphasized this point, but focused most of his remarks on how impressed he is with the Airmen of the 943rd RQS. He lauded their accomplishments making rescues during Hurricanes Katrina, Harvey, and more recently Florence; and spoke about how amazing his team is to maintain the pace of civilian requirements, deployment taskings, and constant training to maintain readiness, and aircraft reliability. 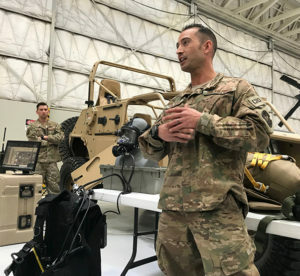 “These things we do, that others may live,” said Beatty and his mission statement, but it’s obvious that the commander and his team have passion and excitement for service. Their service is another outstanding component of the more than 34 mission partners who make Davis-Monthan Air Force Base a premiere Air Force asset and pride of Tucson. 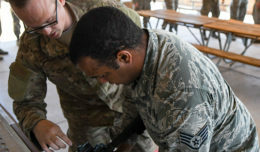 The 943rd Rescue Group is always seeking new personnel to join its very unique and specialized mission. Contact Master Sgt. Robert Capogrosso at 520- 298-2322, for more information about the U.S Air Force Reserve’s 943rd Rescue Group.